Thailand’s King Bhumibol Adulyadej, who died on Thursday aged 88, was the world’s longest-reigning monarch, having spent 70 years on the throne. Thailand is now in 30 days of official mourning. During the mourning period, tourists and expats should be prepared to be flexible, not only now but also in the months ahead. Many Thais have never known another king and they feel his death personally, comparable to the loss of their own father or a family member. In fact, as expats and foreigners in Thailand likening this moment to that of a whole nation losing a member of their family can go someway in to trying to understand the grief the people of Thailand are feeling right now. If you are a tourist just arrived in Thailand or are perhaps due to arrive within the next couple of weeks, or even if you are a long time expat, at the very least you should be prepared to be flexible in the weeks and months ahead and at all times be respectful and mindful during this time. While the likes of banks, public transport, hospitals and shopping malls open as normal, lots of other planned events and touristic venues and activities have been cancelled. Here is a rundown of what else you need to know as well as tips on a few do’s and don’ts following the death of King Bhumibol Adulyadej. After Thailand’s prime minister Gen. Prayuth announced a month of official mourning, many Thai people can be seen wearing black, white or dark coloured clothing. Government employees and public servants have been ordered to wear black clothes for one year. While it is not a requirement for foreign tourists or expats to wear black or white clothes during the mourning period, it is advisable at the very least not to wear bright or vibrant coloured clothes. If you are about to fly out to Thailand, consider packing a couple of black shirts or other items of clothing, as wearing dark will be seen as a mark of respect by Thai people. Swimwear is still permitted on the beach, but away from there, make sure you are dressing appropriately at all times. The weekend following the announcement of the passing of HM the King, many bars and nightclubs in major tourist locations were closed. Nana Plaza, the popular entertainment venue in Bangkok announced it would remain closed for an undetermined amount of time. Soi Cowboy, also in Bangkok, remained open on Saturday only to be closed by the authorities around 11pm. Lots of other bars and restaurants also remained open as alcohol can still be served but you might want reduce or take a more modest approach to consuming alcohol than you may do normally, out of respect. Backpacker haven Khoasan Road has remained open, albeit quieter than usual. Bars on the popular island destination of Koh Chang have been told they can open as usual but music be kept to a low volume and no special events can be organised. In Phuket, local officials asked all bars to remain closed until October 17. On Saturday, some supermarkets announced the sale of alcohol would be suspended until Monday. There are no state or public celebrations during the official mourning period. Any major event you were due to attend within the next month will most likely have been cancelled. The Full Moon Party, due to be held on October 17th has been cancelled, as have pop concerts and theatre performances. Some other major events scheduled later in the year have also been cancelled. In Pattaya, the Loy Kratong, International Firework festival and New Year celebrations have all been cancelled. In Chiang Mai, the popular night markets and walking streets have been suspended until further notice, while the Yi Peng Festival, scheduled for mid November has also been cancelled. 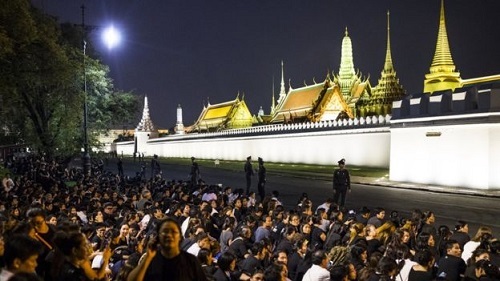 However, the Tourism Authority on Friday issued a statement confirming that, with the exception of the Grand Palace, which is being used the the royal funeral rites, tourist attractions will remain open and can be visited as normal. The Grand Palace will remain closed to tourists until Oct 21. Thailand’s domestic football schedule have also been suspended until further notice. Thailand’s popular beaches and resorts remain open and if you had thought about cancelling a trip or even your whole holiday in Thailand, the advice is not to. If you were due to attend an event in the coming, days, weeks or months, you should contact the venue directly or look for latest information on social media. This is something to take very seriously. Thailand’s lese majeste laws are some of the strictest in the world and prohibit any insults or criticism of the monarchy. If you are found to be insulting a member of the royal family, regardless of how innocent or jovial you think your comments are, you could be sent to jail for a very long time. Thailand’s lese majeste laws also apply to anything you post online or on social media, so please bare this in mind when making commenting. It is also advisable to refrain from entering into any conversation about politics now and over the coming months. That said, as a foreigner in Thailand, don’t feel that you can not offer your condolences to Thai people, in fact this should be encouraged.